For those motorhomers who wish to enjoy Christmas in Germany, Christmas markets are unique, offering traditional treats for the senses: from food and drink to handmade toys, tree ornaments, candles, etc. The stands of the German Christmas markets offer something for all ages. 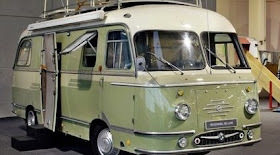 See the corresponding motorhome site or stopover at the end of each city. The main market of the city is in front of the spectacular Gedächtniskirche (Memorial Church), making Berlin a great destination for a unique experience in a Christmas market. This historical and cosmopolitan city has something for everyone, with more than 60 markets scattered around the centre (the longest one runs from November 26 to December 31). 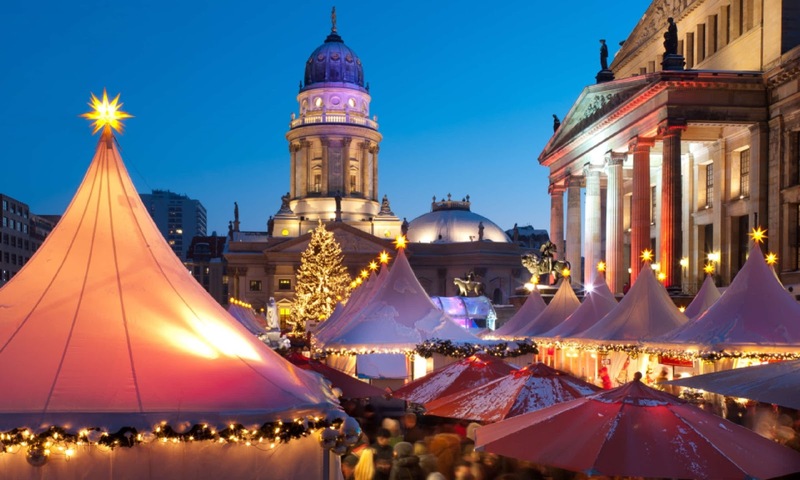 The Gendarmenmarkt (Gendarmes' Market) offers culinary temptations from some of the best chefs in the country, as well as an entertainment feast that includes jugglers, acrobats, fire artists, choirs, dance and music groups. The Potsdamer Platz market, which has the biggest toboggan in Europe, is at 30-minute walking distance. The Market Hall of the Kaiser Wilhelm Memorial Church offers the possibility of finding a gift for everyone among the traditional wooden cabins; Of course, while you enjoy your hot chocolate and nibble the toasted almonds. Meanwhile, the Spandau market celebrates Advent with a Nativity scene presented with live animals. On the other side of the city, the "Christmas Market of Lucía" has a Nordic-Scandinavian theme, which offers a romantic and intimate atmosphere. For the traditional and nostalgic, the Staatsoper and Opernpalais market is worth seeing. From here you can enjoy a horse-drawn carriage ride through the old town of Berlin. Open all the year around. 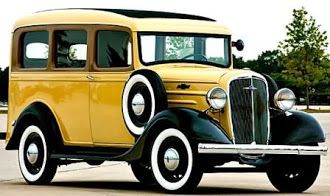 Price: tariff according to the lenght of your motorhome. Find out on the website. GPS coordinates: N 52.45914, E 13.58540 / N 52°27'33", E 13°35'07"
NB: there are parking areas around the city, usually appear in android applications. However, for your own safety, it is advisable to park in motorhome sites or stopovers (stellplatz) that have electricity, as temperatures can be very low in the winter season. Cologne (Köln) It is one of the most popular of a series of Christmas markets during the entire period leading up to Christmas holidays. The most famous of these is held in the shadow of the Cologne Cathedral, the largest in Germany and a UNESCO World Heritage site. 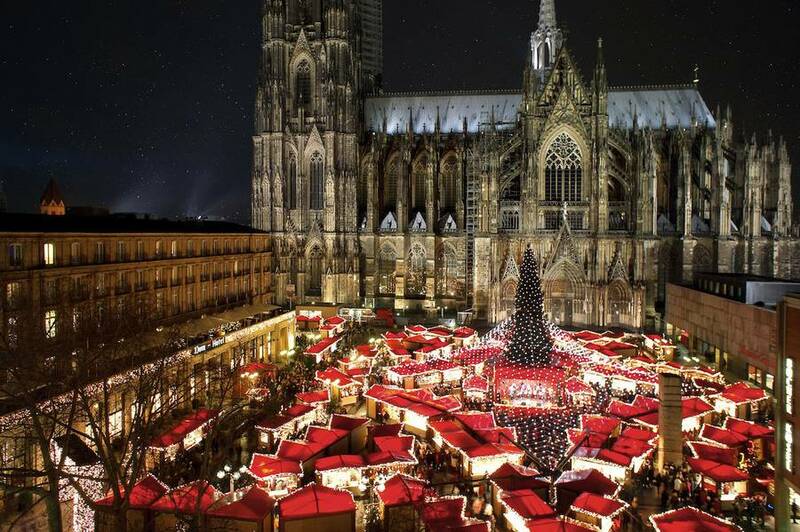 With the imposing Gothic backdrop and the largest Christmas tree on the Rhine, the 'Am Dom' flea market (from November 26 to December 23) offers more than 160 stalls selling the traditional "Yuletide" (Christmas festivities in German) and his famous Glühwein (mulled wine). Traditional music provides the perfect atmosphere for Christmas shopping. For children, the Alter Markt (the Old Market) is the place to go, with the Santa Claus route, puppet theatre and stalls full of toys. The Rudolfplatz will transport large and small children to the world of the Grimm brothers, with fairy tale figures and festive illuminations. Cologne is not just for Christmas: there is much more to experience in the city, as it is considered one of the most interesting places to visit for its art and its traditional style. Open all year around. Price: € 12 per day (motorhome + 2 people); water: € 1,00; hook up electricity: (16A): € 0,50 por kWh. GPS coordinates: N 50.96238, E 6.98594 / N 50°57'45", E 6°59'09"
The Christmas market in Dresden dating from 1434 is traditionally known as Striezelmarkt (November 30 to December 24), it is the oldest in Germany. With the backdrop of the Elbe River, Dresden becomes annually a Winter Wonderland with thousands of twinkling lights: romantic, festive and charming. The Striezelmarkt and its famous Christmas pyramid. Here you can buy figurines for smoking, stars of Advent of Herrenhut and Pflaumentoffel (edible figurines) traditional Dresden, a chimney sweep made of dried plums. Examine the stalls and observe how traditional glassblowers, carvers and bakers practice their crafts. 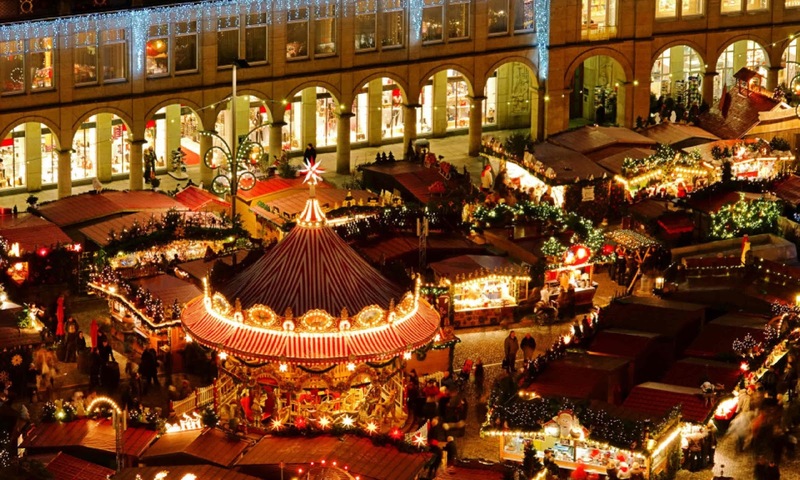 There are also a number of notable Christmas markets that are located around the city, including those held in the stable patios in Residenzschloss (Royal Palace), the famous Frauenkirche (Church of Our Lady) and the Loschwitz market . Käthe-Kollwitz-Ufer 4, 01067 Dresden, Germany. Open all the year around. Price: € 12 per day (a motorhome + 2 people), hook up electricity: € 5. The Gothic town hall that borders the wooden huts of Marienplatz (Marien's Square) creates a spectacular setting for the Christmas market (from November 30 to December 24). Here you can find original Bavarian products, from exclusive Christmas gifts and delicious treats. Christmas concerts play an important role every day with the views of the market, away from the bustle of the crowd, from the balconies of the spectacular town hall. The Kripperlmarkt (Munich's Mangers Market) specializes in all things of the Nativity. For something completely different, Tollwood Market is an urban cultural festival that offers a wide range of music, drama and international cuisine. 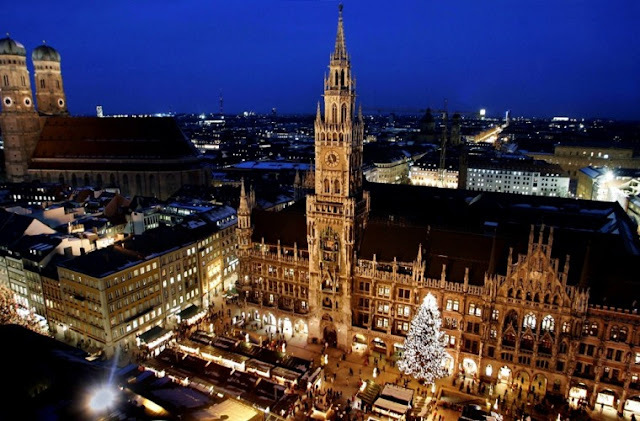 With more than 20 different markets in Munich, there is something for everyone; from a medieval market with gospel choir to the Christmas market, where products selling pink and purple pagodas and shows, etc. Precio: € 15 per day (is located just outside the Bayern Munich Stadium).